In my last post I have shown you how to install Google Chrome on CentOS 7 / RHEL 7; when I tried to start Google Chrome, it gave me the following error. After a long googling, I found an easy way to enable root user to run Google Chrome. 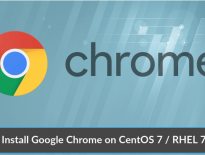 Follow the steps to run Google Chrome as root user in CentOS 7 / RHEL 7. Open Terminal (Applications –> System Tools –> Terminal). Edit the /usr/bin/google-chrome and add the “–user-data-dir” at the end of the last line (Line No: 84). That’s all. Now you can start Google Chrome from the menu as root.